4.5"x20" cartridge system with 5-micron poly-pleated sediment and Siliphos scale inhibitor filter and 5-micron radial green carbon block filter for reduction of dirt, sand, sediment, chlorine, other chemicals. Average filter life - one year. 1" in and out ports with 10-15 gpm flow rate. System assembled with bracket and pressure gauge; comes with housing wrench. 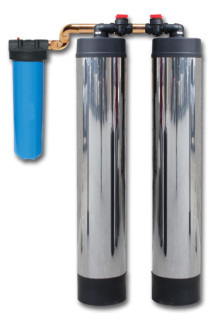 Affordable and cost-efficient whole house water conditioning system with dual filtration and conditioning; comparable to other higher-priced systems on the market today. Small footprint for limited space. System comes with coconut shell catalytic carbon and the media guard (center tube) of four pounds of KDF55 for reduction of chlorine, chloramines, VOCs, herbicides, pesticides, some hardness, some heavy metals; kdf media inhibits bacterial growth; bypass, adapters and attractive welded full stainless steel jacket. Low-maintenance system (center with KDF is replaced every three years; carbon is replaced every five years); five-year limited manufacturer warranty on tank and valve. 1.5 cu. ft. tank, 10”x54” with 1” ports; 10-15gpm. Clack backwash valve (backwashes approximately every eight days or can be set less frequently). Fluoride is a difficult contaminant to remove from tap water, and this system is an affordable option to reduce this contaminant from your whole house. The standard unit is a 1.5 cu. ft. mineral tank with a Clack 1190 1-inch in and out valve, bypass assembly and brass sweat fitting, chrome plastic jacket with black cover and can be combined with our 3-stage whole house water conditioning system or used as a stand-a-lone system. The media used in the tank is bone char, a natural media, comprised of HA1 Natural (Brimac), a High Calcium Bone Char made of charred animal bone. Bovine (cow) bones are taken from cold storage, thoroughly cleaned and put in sun and rain for at least 90 days and totally dried. It is then carbonized at 1472 degrees Fahrenheit in controlled conditions. The result is Kosher Certified, 100% organic bone char made of 80% phosphate of calcium, 10% carbon and 10% calcium carbonate. It lasts a long time, has no toxicity and leaves behind beneficial minerals. There is no pH effect and it can remove chlorine, heavy metals and radioactive isotopes on top of fluoride. Bone char is considered a more effective contaminant remover than coconut because it is hundreds of times more porous and contains calcium which attract the fluoride. Fluoride removal requires greater contact time for its removal as it is considered a dissolved solid. The calcium content in the bone is what removes fluoride. Calcium attracts the fluoride whether it is calcium or sodium-based. Besides fluoride, bone char is very effective at removing chlorine from drinking water. Being a highly porous medium, bone char will remove most known contaminants. 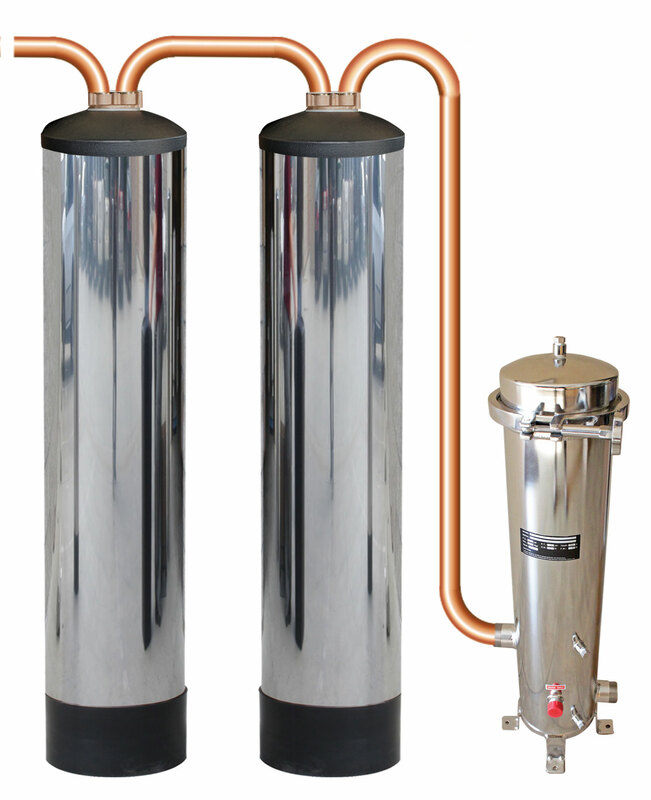 This method of filtration is used to remove or reduce lead, cadmium, mercury, iron, manganese, copper, zinc, aluminum, nickel, arsenic, radio-nuclides, fertilizers, uranium, radium, pesticides and herbicides. 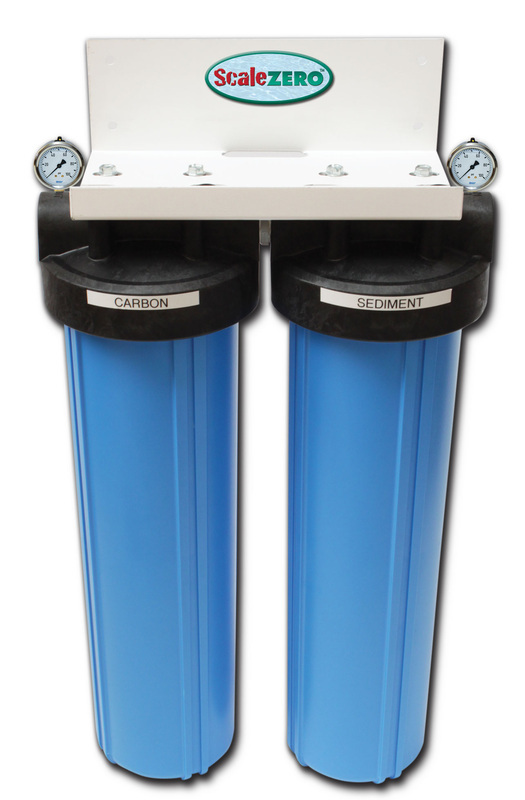 4.5"x10" cartridge system with 5-micron poly-pleated sediment filter for reduction of dirt, sand, sediment, and large particles. Average filter life - two years and is washable after one year. System comes with filter, bracket, and housing wrench. 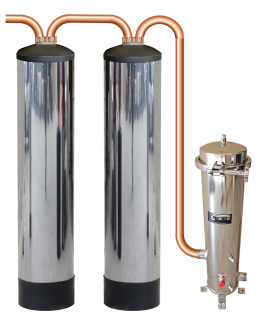 4.5"x10" cartridge system with 5-micron pleated sediment and carbon-impregnated filter for reduction of dirt, sand, sediment, large particles and chlorine. A three-stage system to effectively reduce many contaminants found in tap water today. A low-maintenance solution to protect your family. System provides clean water from every faucet with easy installation. Stage two of this system uses a proprietary and patented technology that filters water through an electroadsorptive process creating sub micron filtration. This filter has been tested by a certified lab in the U.S. and has been shown to reduce up to 99.99% of virus, bacteria, and cysts, 95% lead, 80% ferrous iron, 95% arsenic V, 60% mercury, 95% cadmium and 75% selenium. It also reduces chloramines, volatile organic compounds, PCBs, residual pharmaceuticals and chromium VI. Stage one - 20-micron polyester pleated sediment filter reduces dirt, sand, sediment, and rust. 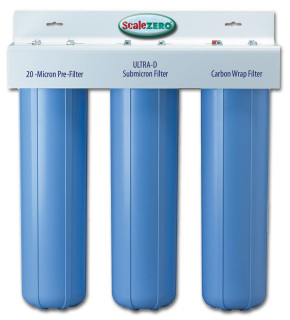 Stage two - ULTRA-D Submicron Filter with a proprietary technology reduces virus, bacteria, cysts, lead, other heavy metals, chloramines, arsenic III and V, volatile organic compounds, PCBs, chromium VI, and residual pharmaceuticals. Stage three - Carbon Wrap Filter reduces chlorine, bad taste and odor, and scale through the German-engineered scale reduction media, Siliphos. We specialize in providing a customized system for your well water needs. It is critical to have a recent water test done on your well water to ensure that all contaminants are discovered and removed. There is no way of determining the proper system without knowing what's in your water. And it's also important to find out if any contaminants are a danger to your health. 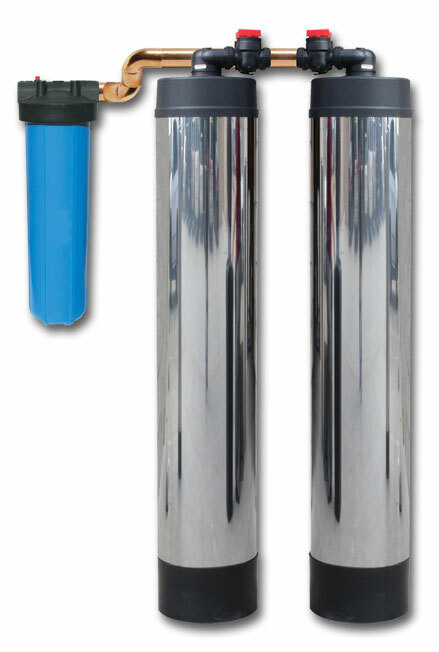 Whether it is iron and manganese or arsenic in your water, we can design a system customized for your needs. We use a nationally recognized laboratory and will provide you with a comprehensive water analysis that's easy to interpret. And if you decide to purchase your customized system from us, we will deduct the cost of the water analysis from your purchase. 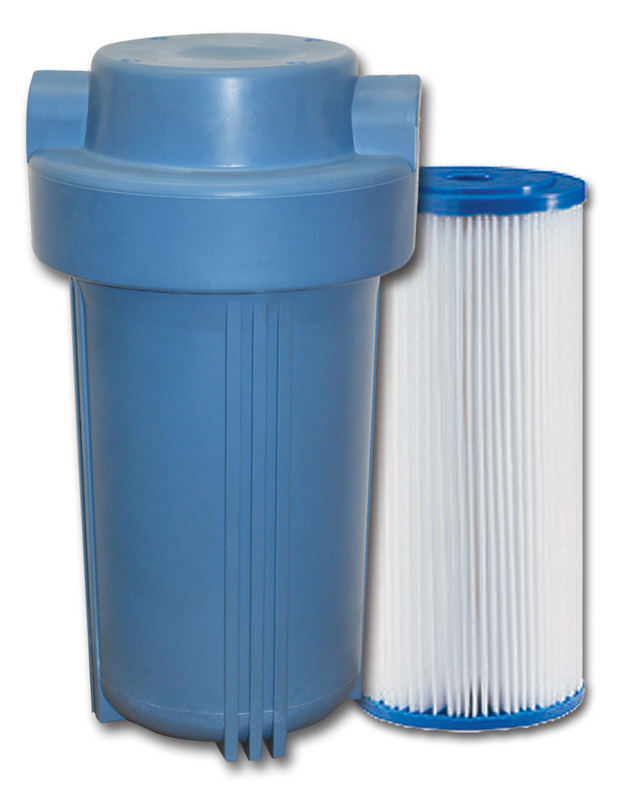 U.S.-mf'd 4.5"x20" polyester pleated 5-micronsediment filter reduces dirt, sand, rust, sediment. For greater dirt-holding capacity, lower pressure drop and greater flow rate. 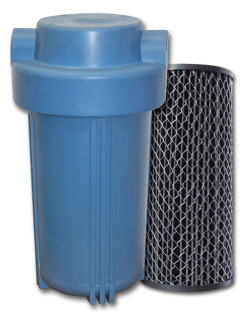 Used for whole house and other applications for greater filtration capacities. Can be washed up to two times. PLEASE DOWNLOAD THIS COMPARISON CHART TO SEE THE DIFFERENCE BETWEEN OUR WATER CONDITIONING SYSTEMS AND A WATER SOFTENER!